For a decade, Suburban Nation has given voice to a growing movement in North America to put an end to suburban sprawl and replace the last century's automobile-based settlement patterns with a return to more traditional planning. Founders of the Congress for the New Urbanism, Andres Duany and Elizabeth Plater-Zyberk are at the forefront of the movement, and even their critics, such as Fred Barnes in The Weekly Standard, recognized that "Suburban Nation is likely to become this movement's bible." A lively lament about the failures of postwar planning, this is also that rare book that offers solutions: "an essential handbook" (San Francisco Chronicle). This tenth anniversary edition includes a new preface by the authors. Andres Duany, with Elizabeth Plater-Zyberk, leads a firm that has designed more than 200 new neighborhoods and community revitalization plans, most notably Seaside, Florida. He is co-author of Suburban Nation. Andres Duany and Elizabeth Plater-Zyberk lead a firm that has designed more than 200 new neighborhoods and community revitalization plans, most notably Seaside, Florida. 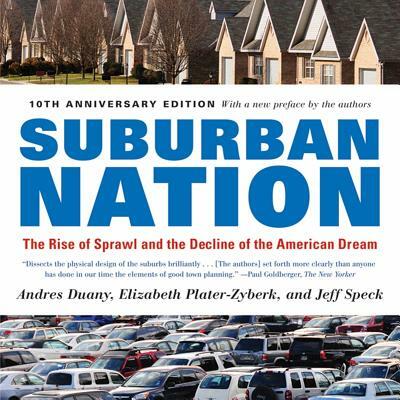 Jeff Speck, coauthor of the landmark bestseller Suburban Nation, is a city planner who advocates for smart growth and sustainable design. As the former director of design at the National Endowment for the Arts, he oversaw the Mayors’ Institute on City Design, where he worked with dozens of American mayors on their most pressing city planning challenges. He leads a design practice based in Washington, D.C.